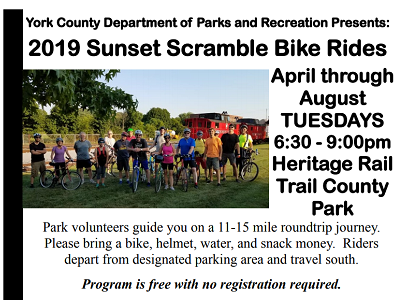 The York County Department of Parks and Recreation will host Sunset Scrambler Bike Rides on Tuesdays from April 9 to May 21, 2019. Rides will begin at a different parking area each week and will be held from 6:30 to 9 p.m.
Park volunteers guide you on an 11-15 mile roundtrip journey. Please bring a bike, helmet, light, water, and snack money. Riders depart from the designated parking area and travel south. Directions to Rail Trail parking lots can be found on the York County Parks’ website, https://yorkcountypa.gov/parks-recreation.html. There is no fee or pre-registration required. 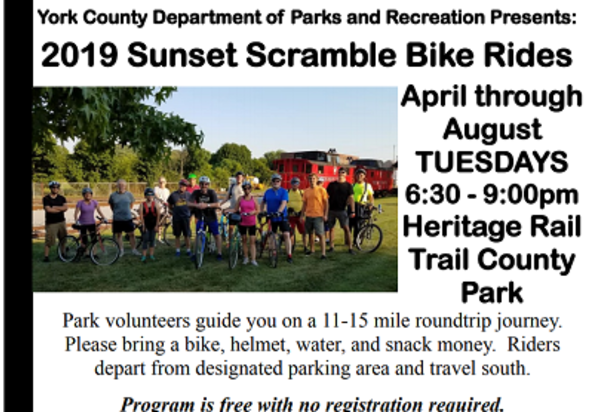 Cancellations due to weather will be posted on York County Parks’ and Sunset Scramblers’ Facebook pages. Call 717-840-7440 to find out the status of the ride. For information on this and other programs, go to yorkcountypa.gov/parks-recreation.